In the years since, the model has grown from four to over forty congregations across North America and Europe, with new communities emerging on a weekly basis. While every church has its own feel, the concept is the same: connect with others in a language spoken by all – food. Serving a hearty meal at a table with real napkins, dishes, and silverware, the services aim to feel like a dinner party, fostering conversation among men, women, and children who might otherwise never meet. These churches encompass a range of denominations, both conservative and progressive, and they meet in a variety of settings: in church basements, restaurants, gardens, and art galleries. Found in urban, suburban, and rural areas, they attract wealthy, middle class, and unhoused neighbors. The intergenerational and multi-ethnic congregations create engaging dialogue; and the meals become a space where diners can disagree and still maintain close relationship. Throughout the evening, they read Scripture, sing, and pray, but most importantly, they eat. Central to the process of eating is engaging in dialogue, providing space to respond to the Scripture or sermon. This new way of doing church, which Saint Lydia’s fondly coined a ‘dinner church’, is modeled after the earliest gatherings of Christians as described in Acts 2: “They broke bread in their homes and ate together with glad and sincere hearts,” (Acts 2:46). Early church father Tertullian further describes these early church meetings, called Agape feasts, all based on the idea that Jesus’ Last Supper was intended to be a model for how Christians worship together. “For the first 300 years, Christianity was done around dinner tables more than any other way,” says Verlon Fosner of Seattle’s Community Dinners, who uses the writings of Tertullian as a model for his services. Something very powerful happens when meeting in this manner. 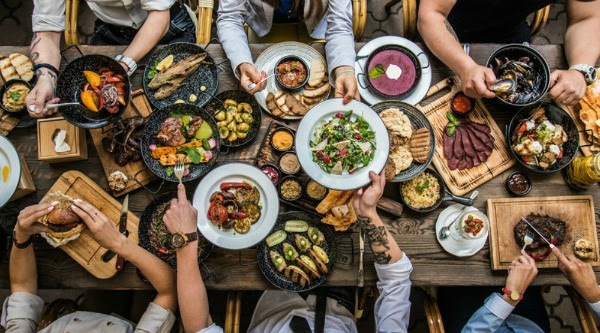 By intentionally pulling together a diverse group of people around the shared need to eat, it is impossible to worship without acknowledging the variety of needs and experiences of those around the table. The Apostle Paul chastised the Corinthian church for stratifying their services based on socioeconomic status, stifling diversity at the table. The poor were left hungry while others got drunk, turning the worship gatherings into places of division rather than methods of unification (1 Corinthians 11:17-34). For contemporary dinner churches, returning to the table for worship aims to reclaim the social boundary-breaking power of the Eucharistic meal, signifying a commitment to unity in Christ’s Body.